I had not seen John for five years. He called me up a few months back and wanted me to come stay with him in Mississippi while we were in danger from the nuclear radiation that was drifting toward the West Coast. We were told by the government that we had no worries here in Southern California. But then I heard a guy talking about a program ran during World War 2. The program was a put-a-bomb-on-a-balloon and launch it toward the enemy. From Japan. And where did the winds take them? Southern California, where I live. So, logically, based on evidence, a cloud of something nasty could make its way to my house. Not so crazy. The one kind of radiation had a short half-life. So maybe it was not so dangerous after all. Maybe just taking some potassium iodide would be enough. Not to worry. But why did John call me up? Why did he sound like a guy who really thought the government might be hiding something from us? It turns out that the company operating the nuclear plants in Japan definitely was not forthcoming with the truth. And that the Japanese government was also tight lipped when we all could have used more light. Certainly the Japanese government was not the model for the USA. But John had encountered another big event in his life and was now seeing a side of Big Government and Big Business that the “little people” like him were not supposed to know about. He had survived Hurricane Katrina and now was suffering from severe toxic exposure from the BP Oil spill. I met John and Mary Gooding in Pass Christian several months after Katrina hit. My priest, Father Carlos, had organized a small group to visit our fellows in Mississippi to help out for a week. We would do whatever we could: simple clean-up, cooking meals for other helpers, repairing buildings, clearing fallen logs, and just sitting and listening to folks tell their stories. Lots of groups came from all over to do the same, some for a week, some for months, some for a year, some are still at it today. No government program, no pay, no glory, just friends helping out. This is the kind of thing a lot of us do. Tornadoes, earthquakes, floods, hurricanes, snow storms, and sometimes for just hard times. It is the unwritten side of being an American, our untold story. We do stuff for our neighbors when we can and we do it again next time. No big deal. 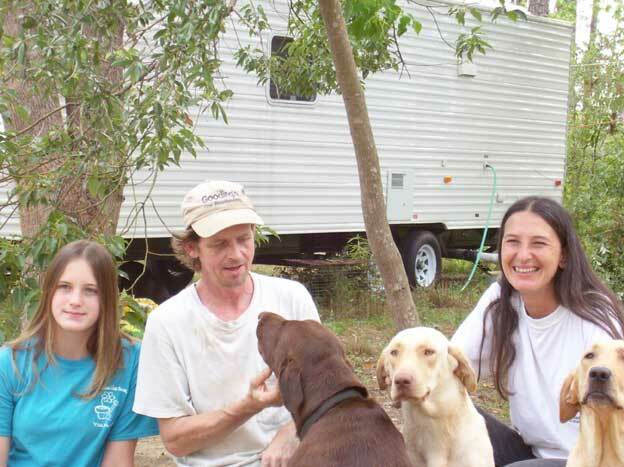 John and Mary Gooding with their daughter and three dogs after Katrina, FEMA trailer too! One day in our work in Mississippi, we went to John’s house. He had two before Katrina. One was right in Bay St. Louis. It was badly wrecked by the storm surge, pushed off its foundation and just a big mess. John’s other house was in Pass Christian, but north of the Interstate 10. The storm surge did not make it that far. Lots of rain, wind, storm and all that. It was a house he was building. His basement was in, but the upstairs had just been started. After the storm the wooded lot was marked by many fallen trees, blocking his roadway out. John came out of his shelter and started cutting the trees so he could get his white pickup truck out. He wanted to see what had happened to his other house by the water. Once he got near it, he saw the devastation and the needs. Some folks had stayed closer to the water and many were in need of everything. He left and went searching for help. In time, he found that the only functioning government was the army. He argued his way into them giving him water and ice and letting him bring it back to those in need. For the next three weeks he spent all his time driving water and ice to his neighbors. He earned a separate lane at the army supply station so he would not have to wait in line. He got called “the Iceman” by many for his efforts. He did endure harsh conditions, getting in contact with hazardous materials that had been washed away into the waters by the storm. But he kept up his work for those three weeks. John was a carpenter and fine wood-worker. He was also a musician, writing songs to sing and play on his guitar. When I met him, I took back a bit of his music and story and started a podcast series. Got two done. Here is link to the first one. John Gooding, the Katrina Iceman. Now imagine my surprise to see John’s picture on the landing page of Aljazeera yesterday. I knew it was him. I did not know the story. It grabbed my heart. Here was a man who I knew to be a good man being thrown away like trash by a big corporation. I want you to read the story. Aljazeera.net has Sick Gulf Residents Continue to Blame BP. You will read about John halfway down the story. You will hear him say that he has no money to go to the doctor for treatment and that the company hired to hand out the restoration money from BP Oil has rejected his claim. That company is being paid $850,000 a month to do this work. To hand out $20 billion. Two of his dogs are dead. He is having a hard time even breathing, much less doing his work with wood. A simple wooden cross he made as a thank you hangs in our parish hall at St. David’s as a reminder of his gratitude. It reminds me that a local man in Mississippi who loved his neighbors as himself enough to take them ice and water when no one else could function. And that a big, multinational corporation runs away with a bundle of wealth extracted from the earth and leaves death behind. Shame on BP. I wish my story had a happy ending. My grandma Marguerite Lund used to say, “If wishes were horses, beggars would ride.” But if you hear of any opportunity to set things right or to make BP accountable, I would ask you to step up and do what you can. If you have the ear of government, tell John’s story to them. Or the media, tell it. Maybe we can get something done together. This entry was posted in Personal Anecdotes, Reflections on Living and tagged BP Kills, death in the gulf, Gulf Oil Spill, Hurricane Katrina, John Gooding, little people, the Katrina Iceman. Bookmark the permalink.